Lots of months have a special theme. February is Black History Month. June is Aphasia Awareness Month. April is Autism Awareness Month. A special month for speech-language pathologists and audiologists, sponsored by the American Speech-Language Hearing Association is Better Hearing and Speech Month each May! Throughout this month, speech-language pathologists and audiologists discuss strategies to promote better hearing and speech! In addition, resources are given, hearing screenings/tests are promoted, there is a significant amount of media promoting speech and language development, and more! 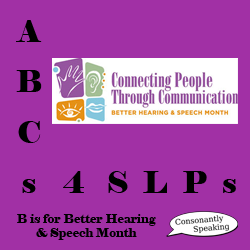 Continue reading for more information and resources for Better Speech and Hearing Month! The official website for Better Hearing and Speech Month is on ASHA's website - http://www.asha.org/bhsm/ Here, each year you can find materials, press kits, contests, information packets, posters, information, and more related to Better Hearing and Speech Month. This year's theme (2012) was "Connecting People Through Communication". 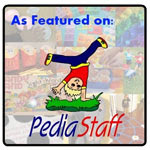 This year, the blogging world boomed with resources for Better Hearing and Speech Month! 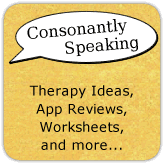 I highlighted a list of these blogs and materials on an earlier post titled "Free Printables for Better Hearing & Speech Month"! In addition, I shared a coloring homework activity sheet and a writing prompt worksheet for Better Hearing and Speech Month! I cannot wait to see what ASHA and other speech-language pathology bloggers come up with next year to promote better speech and hearing! Of course, we should also remember to promote this year round by providing appropriate recommendations for speech and hearing screenings, evaluations, treatment, and more in the community!